The date of the John the Baptist in the Galleria Borghese is disputed: it was long thought to have been acquired by Cardinal Scipione Borghese some time between his own arrival in Rome in 1605 and Caravaggio's flight from the city in 1606, but Roberto Longhi dated it to the artist's Sicilian period (a date post-1608) on the basis of similarities in handling and colour. Longhi's view has gained increasing acceptance, with a consensus in favour of 1610 emerging in recent years. The painting shows a boy slumped against a dark background, where a sheep nibbles at a dull brown vine. The boy is immersed in a reverie: perhaps as Saint John he is lost in private melancholy, contemplating the coming sacrifice of Christ; or perhaps as a real-life street-kid called on to model for hours he is merely bored. 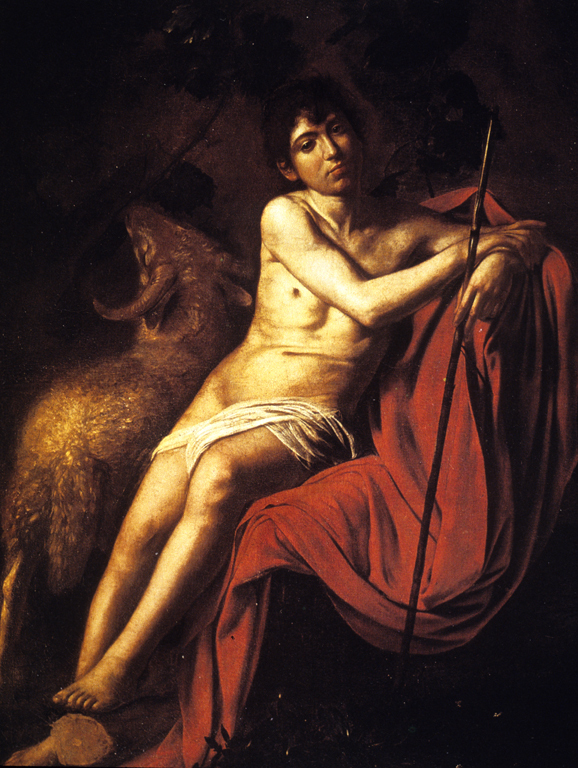 As so often with Caravaggio, the sense is of both at once. Michelangelo Merisi da Caravaggio (Italian painter, 1571-1610), “St. 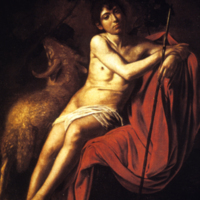 John the Baptist,” Institute Images Online, accessed April 24, 2019, http://westerncivart.com/items/show/2838.